Do you love going to the dentist? Your children will! 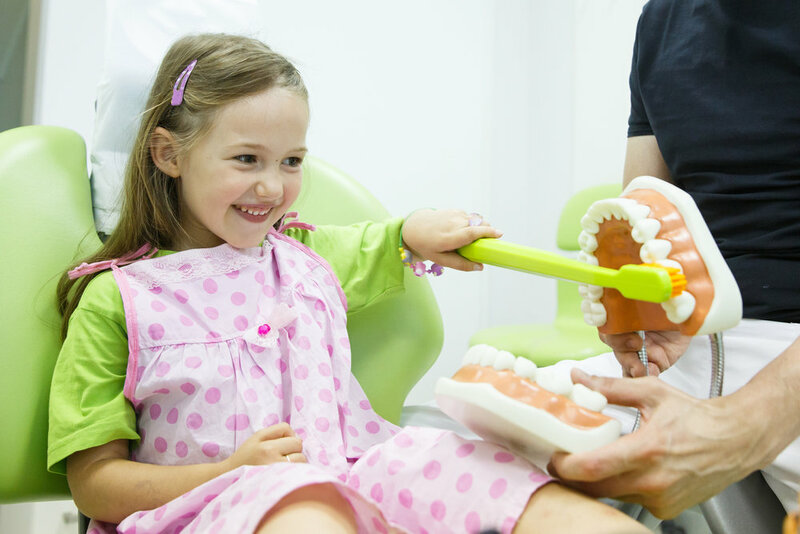 A Pediatric Dentist is trained specifically on how to help your child: love going to the dentist, and in preventing and repairing dental damage already done. At Idaho Pediatric Dentistry we use a gentle touch and a positive atmosphere to making dental visits fun. Our team of pediatric specialists love kids and have been specially trained to help them feel at ease. Our goal is to make going to the dentist a memorable, positive, fun, and educational experience. What is a Pediatric Dentist? (Pedodontist)? Upon successful completion of dental school, a pediatric dentist will train for an additional 2-3 years at a university or hospital pediatric board certified facility. They become expert in behavior modification and behavior molding. They become specialists in child and adolescent oral growth and development, in treating special patients, dental decay, trauma, prevention, sedation, and hospital dentistry. They learn how to help your child complete their needed dental care without causing long-term dental fear. They are the dentist that you wish you had as a child. What dental problems could by child get? Early dental visits, before age one, have been shown to be a highly effective way to prevent larger problems in childhood. Your child can obtain decay at a very early age. Our doctors have treated many children at age 1-2 years with extensive dental problems that largely could have been prevented. Gum disease is also another problem that can be properly treated if properly caught in time. Why are baby teeth important? Aren’t they going to fall out anyways? Primary teeth are important in function, esthetics, and space maintenance. They also contribute to proper speech and lip support. Having healthy primary teeth allow for the normal eruption of the permanent teeth and in the development of the jaw bones and muscles. If a child's tooth becomes decayed and infected, extraction without proper space maintenance can lead to crooked permanent teeth or other problems. Decay in baby teeth can happen very quickly. A small lesion can become large and then infected very commonly within one year. Primary front teeth do being to fall out around age 6 but continue to exfoliate until around age 12. A decayed primary molar in a young child has much more potential to become infected before it falls out, than not, if left untreated. Infection in primary teeth can lead to damage to the permanent teeth growing below in the bone. The AAPD and the AAP recommends that your child see the dentist at a very early age, around 6 months to before 1 yrs old. It has been shown that early dental visits can prevent more costly dental treatment in the future. It is less expensive to prevent it than to have to treat it. What should I tell my child about their first visit? You know your child best. Some kids do better not knowing, other need to know. Not knowing, allows our professional staff to guide them into a very positive first dental experience. Some children do better knowing whats coming. If they have preconceived negative notions of what is going to happen, you may want to positively educate them. You can start by reading positive books with them and using positive reinforcement. Express your confidence in their abilities to do good! I think it is funny that dentistry is one of the only professions that do their best to put themselves out of business. We are huge on prevention! Regular 6 month dental visits with proper prevention, including fluoride varnish, have been shown to be highly effective in dental decay prevention. Sealants are another great source to prevent decay on permanent molars. Anticipatory guidance has been shown to be very effective in prevention. We use the latest in proven technology and supplies to ensure that your child is receiving the best care possible. We use state-of-the-art sterilization procedures for all of our instruments. We also go beyond the recommended testing procedures to ensure that our processes are working effectively and that all our instruments and supplies are properly sterilized and clean. We thoroughly disinfect each chair between patients, we ultrasonically clean and heat pressure sterilize all non-disposable instruments. We use non latex supplies to prevent allergic reactions. Clean instruments and treatment areas are important to us.